Rancho Cordova, Calif., July 17, 2018 — VSP Global® is proud to honor five students of optometry as recipients of the 2018 Dr. Marvin R. Poston Leadership Award. 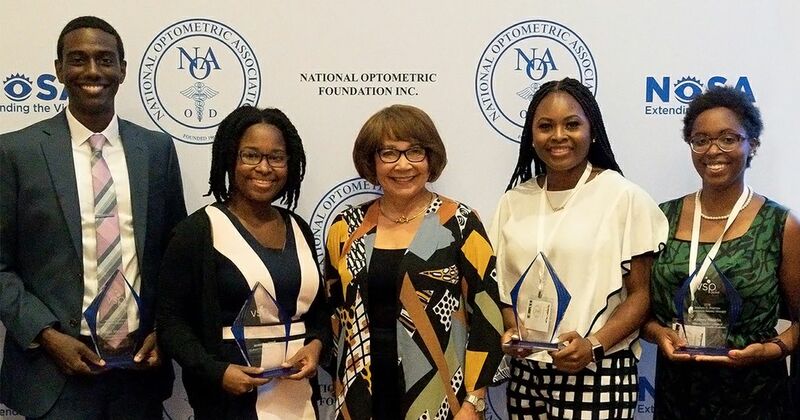 Named after a founding member of California Vision Services, now known as VSP Global, the award is presented annually in collaboration with the National Optometric Association (NOA), to recognize young leaders in the field of optometry who have upheld the same commitment to leadership, service, and diversity as Dr. Poston. Committed to a career of leadership and service to the profession of optometry. VSP Global® is a doctor-governed company that exists to create value for members and opportunities for VSP network doctors. Our industry leading businesses include VSP® Vision Care, the only national not-for-profit vision benefits company, which provides access to eye care for 88 million members through a network of 39,000 doctors worldwide; Marchon® Eyewear, Inc., one of the world’s largest designers, manufacturers and distributors of high quality eyewear and sunwear; VSP Optics, industry leaders in ophthalmic technology and lab services, providing custom lens solutions for the vision and lifestyle needs of patients; Eyefinity®, the industry leader in practice management and electronic health record software, and VSP Retail, which focuses on increasing access to eye care and eyewear through multiple channels. Together with VSP network doctors, VSP Global's Eyes of Hope® has provided access to no-cost eye care and eyewear for more than 1.8 million people in need.